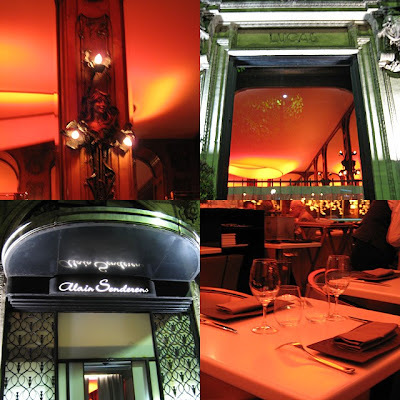 Our first dinner booking in Paris was at the former Lucas-Carton restaurant of chef Alain Senderens, renamed simply Senderens. In 2005, chef Senderens sparked a gastronomic controversy when he renounced his three Michelin stars especially since his restaurant Lucas-Carton had continuously been rated trois macarons for 28 years. He wanted a change from the formal luxurious surroundings expected of a classic Michelin-rated restaurant and create a simple yet modern temple to haute-cuisine without the frills and the fuss and he has successfully done just that in Senderens. The national heritage building on the Place de Madeleine has retained its’ original facade with the addition of modern lighting and a new sign simply saying – Alain Senderens. The interiors on the other hand have undergone a face lift of sorts. The art-nouveau details have remained in the Majorelle wood-framed mirrors and whimsical sculptured lamps but the furniture and lighting are completely new. Tables are sans tablecloths and set simply with a wine glass, a tumbler (as is the fashion nowadays), cutlery, a linen napkin and a rectangular black stoneware plate making a very modern Asian tableau. Over the traditional mirrors, an abstract light design is etched on glass and is noticed because of the constantly changing colors. The ceiling has been covered in stretched material to make for even more subdued indirect lighting – the kind that makes everyone look good. We were seated as soon as we arrived in the front room. There are two – the one we were seated in and another one set off to the side. The restaurant was full for a Wednesday evening with couples and a few businessmen but there was noticeably no dress code as some were in jeans while others were all dressed up. We had a glass of rosé champagne to start while we perused the menu and a basket of wholewheat baguettines were served along with some cold unsalted butter. Menus are printed and placed in a simple cardboard cover. The menu has six appetizers, three fish and four meat main courses followed by a selection of cheese and an assortment of half a dozen desserts. 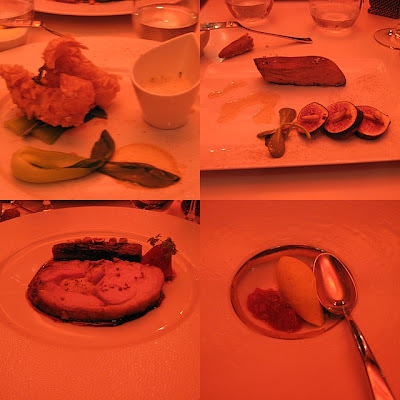 There was also a five-course menu degustation for 110€ without wine and 150€ with every course paired with wine. Since we were celebrating, we opted for the latter and left ourselves in the able hands of the chef. Our amuse-bouche was served immediately: a small shot-glass portion of warm leek soup accompanied by a twist of filo-pastry filled with melt-in-the-mouth ham and slivers of Parmesan. First course was crispy langoustines tempura-style coated with crushed filo pastry with a soy sauce and coriander foam dip and sauteed baby pak-choi. This as accompanied by a chilled glass of Anjou “Bonnes Blanches” 2004, A. et R. Mosse. The langoustines were crispy on the outside and soft inside and the soy sauce reduction with the coriander was the perfect accompaniment. Roasted foie gras of duck with a fig salad, liqourice powder and almonds followed paired with a Muscat Rivesaltes Ambré 1995, Domaine Cazes. The foie gras was lightly roasted and the rich flavor of the duck liver was offset by the sweet figs and the wine although neither of us could finish the whole glass of the Muscat, finding it cloying and too alcoholic since we still had three courses to go. At this point, we took a little break and went outside so T could have a cigarette break. Surprisingly, Senderens restaurant is entirely smoke-free. Tant mieux! The mid-degustation pause was what we needed to continue on to the next course. The plat principal was a roasted Castillian lamb, piquillo peppers, peeled aubergine and a hazelnut-curry paste along with a Coteaux du Languedoc “Aurel” 2001, Domaine les Aurelles. Lamb is traditionally accompanied by aubergine but in this case, the roasted peeled aubergine was given a twist with the addition of the curried hazelnut paste, both of which were excellent with the tender roasted meat. A palate cleanser came next – cold saffron cream, lemon marmalade and a sweet red pepper confit. Finally dessert was served along with a candle, which was a pleasant surprise as neither of us mentioned it was a birthday, although the Maitre’d must have heard me toasting T “Happy Birthday” at the beginning of the meal (now, that’s what I call extra-special attention). It was a creamy old-fashioned pistachio ice cream with fresh raspberries and raspberry coulis with a La Spinetta Moscato d’Asti 2006. 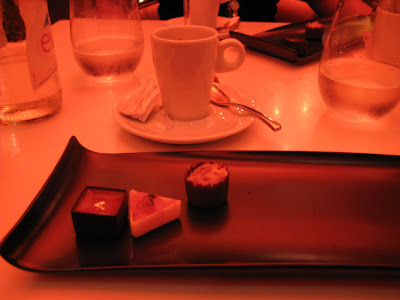 Espressos and petits-fours finished off our meal. Soon after, we stepped outside onto the Place de Madeleine, hailed a taxi and enjoyed a quiet ride back to the left bank, admiring the Place de la Concorde and the views of the river Seine. 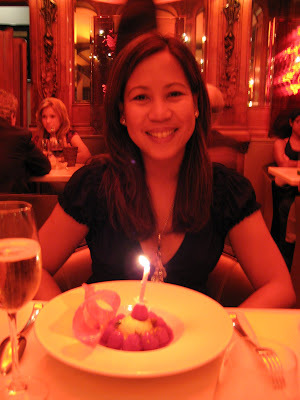 It was nice to be able to accompany T on this special occasion, not only because it was her 45th birthday but also to toast her new life after a difficult two years and what better place to do that than Paris.